Here we are, it’s March 3 and I haven’t changed my calendar yet! Meghan, can I use that as the first thing on Next week’s Week In Review?! Meghan is our lovely hostess for Week In Review. Be sure to check out all of the other bloggers who link up at Clean Eats, Fast Feets every week. I love WIR because it helps me to see exactly what I’ve done in a week. Makes me feel much more accomplished than I did before I joined in. Besides, I’m starting to appreciate Meghan’s love of lists that started the whole thing! ~It snowed!! I realize that I had nothing to do with the snow, but it had an impact on my week and helped to contribute to my general feeling of craziness. I am truly tired of the snow as I’ve been saying again and again. You’re probably sick of hearing it, but I’m sick of experiencing it. Ok, that’s off my mind now. ~Another good week of going through the Artist’s Way program. We completed Week 8. I did my morning pages every day and I’m amazed that I only have about 6 pages left in my current MP notebook. I have another at the ready. I’ve been saving up journal books for years never knowing what I was going to do with them. Now I know. I love the exercise of doing the pages. They are a great way for me to start the day, dump out a bunch of things and I do believe it will be a practice that stays with me. ~We got all of our tax paperwork in the mail. So glad when that’s accomplished. Come on Refund! ~I exercised six out of the last seven days. I feel so much better doing this. I am now realizing why I always did my exercise bike each morning even when I was still working. It makes me feel so good. Especially now with my hip issues. This is truly a wonderful thing. I’m up to 35 minutes now and I may try to raise that as this new week progresses. I may even try to add a short ride in the afternoon. I’m feeling so good about it. ~I have decided that something that is missing in my life is meditation. I had meditated for quite a while in 2013. I believe at one point I was up to 109 days in a row without missing. I’ve downloaded several apps to my phone which are quite good. Each one has several choices of either music or sound (chimes, chanting, wind, water) that are very good for calming and focusing me. Today for some reason, it didn’t work, my mind kept moving to things I have to do today. This blog post was one of those things. One of the main reasons I usually do it on Sunday is because then I have time to think about it and not be rushed on Monday. Note to self…Do Week In Review on Sunday…Always!! Here’s a little look at what I see when I meditate. 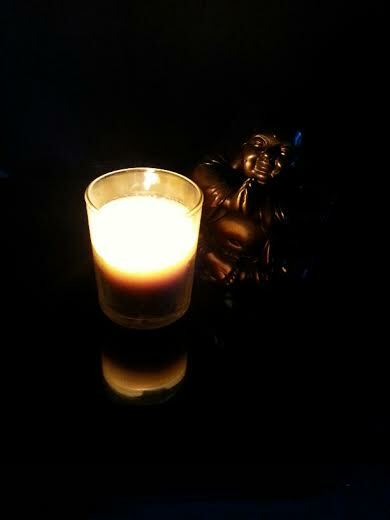 A flickering candle and the wonderful Buddha that my sister, Ele got for me. Very peaceful. ~I read poetry. Not something I’ve done in quite a while. Monica who is the leader of our Artist’s Way cluster, loaned me a book of poetry by Mary Oliver. I must confess that I am ashamed that I don’t think I’ve ever heard of her. She won a Pulitzer Prize for poetry. However, I’ve found her now and I’m a fan. I need to read more poetry. It will probably encourage me to write more as well. When I get to my project of going through the books at my sister’s house, I need to pull out some of my poetry books and get into them again. That’s about it for me for Week In Review. I have big plans for this coming week, so I intend to have a much longer list next week! Be sure to check over at Meghan’s Clean Eats, Fast Feets to see what everyone is up to. Have a great week! This entry was posted in Uncategorized and tagged exercise, meditation, Week In Review. Bookmark the permalink. This sounds like a very good week for taking care of Fran: exercise, your morning pages, poetry reading and meditation. Nicely done Fran. These things are all so important for recharging your batteries. For me, I need to meditate more. It’s calming, and earlier this year I was managing to do it a couple times a week, but I’ve fallen off that band wagon. Time to get back on. Thanks Fran for reminding me.